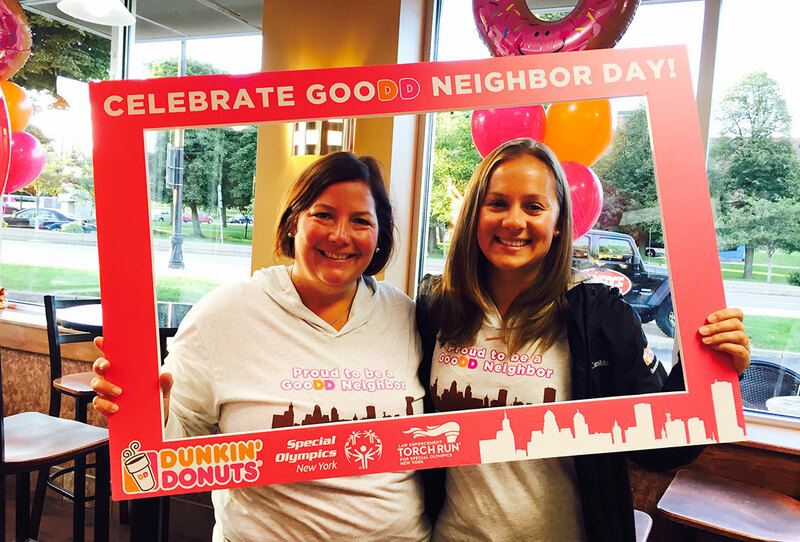 In May 2016, Dunkin’ Donuts was aiming to grow its brand recognition in Buffalo and make an emotional connection to coffee consumers. 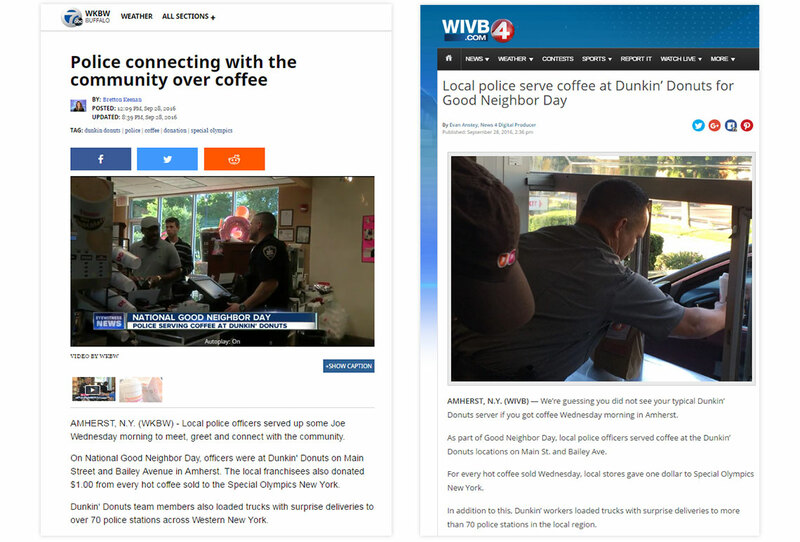 While America may run on Dunkin’, earning local media coverage for a consumer brand in WNY can be difficult. Also, a local competitor was gaining momentum in the market through robust, community-based public relations efforts like sports team sponsorships. So when Dunkin’ came to Crowley Webb for public relations help, our goals were clear: earn positive news coverage, show that Dunkin’ Donuts is a good neighbor in Buffalo (thus creating a positive impression of the brand), and earn additional social media exposure through local influencers. What better way to foster good feelings and gain positive attention as an invested member of the community than to recognize and give back to the heroes of Buffalo – our local police officers? This thinking led to the creation of GooDD Neighbor Day, a local event celebrated on National Good Neighbor Day (September 28). 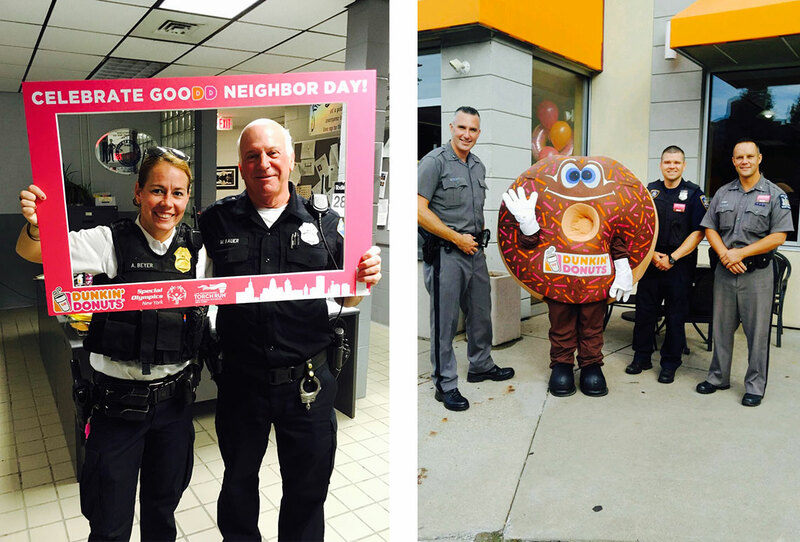 A field team from Dunkin’ Donuts traveled to Buffalo and spent the day delivering coffee, donuts, and gift cards that featured the Buffalo skyline to more than 70 WNY police stations. 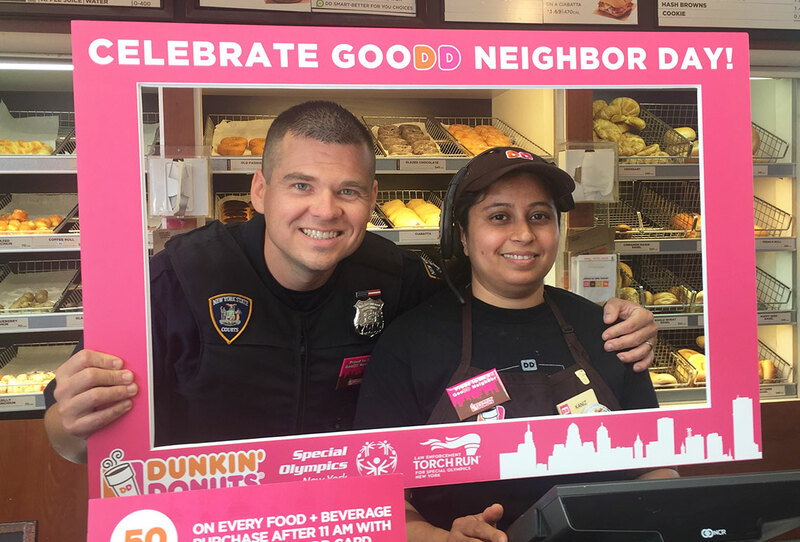 In addition, we arranged to have local police officers serve coffee at a Dunkin’ Donuts located near a college campus, where they could meet, greet, and connect with the community members they serve and protect. Additionally, local franchisees donated $1 from every hot coffee sold that day to the New York chapter of the Special Olympics, which is an organization that law enforcement agencies across the nation have adopted. 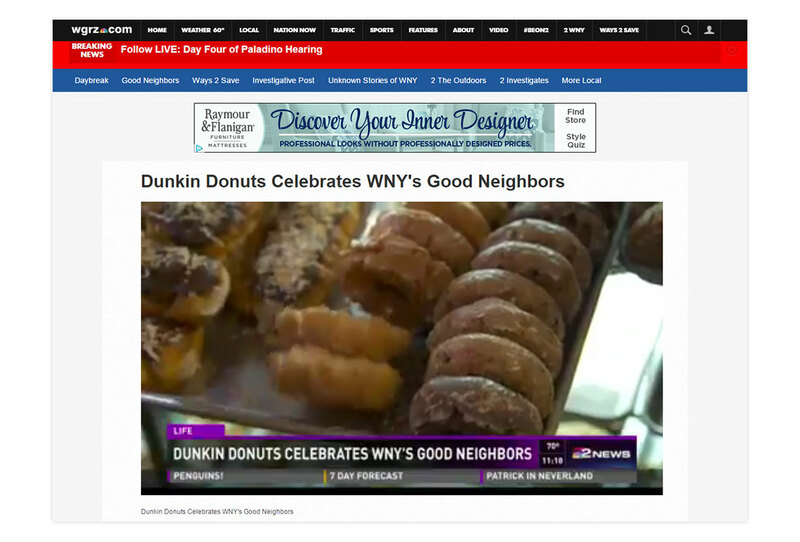 The event helped Dunkin’ Donuts connect with local customers like never before, and it got Buffalo media to take notice. All four major news outlets (WGRZ, WIVB, WKBW, and Spectrum), with a combined viewership of 104,117, covered the day. In addition, we saw a high volume of conversations on Twitter from local influencers – and Dunkin’ Buffalo’s Twitter page saw increases in engagement and number of followers. And as the cream in the coffee, our campaign received a Gold Excalibur Award from PRSA Buffalo Niagara in the media relations category.